The United Nations Framework Convention on Climate Change (UNFCCC) Cancun Agreements in 2010 and Durban Outcomes in 2011 called for REDD+ national strategies and systems for providing information on how safeguards are being addressed and respected to integrate ‘gender considerations’. 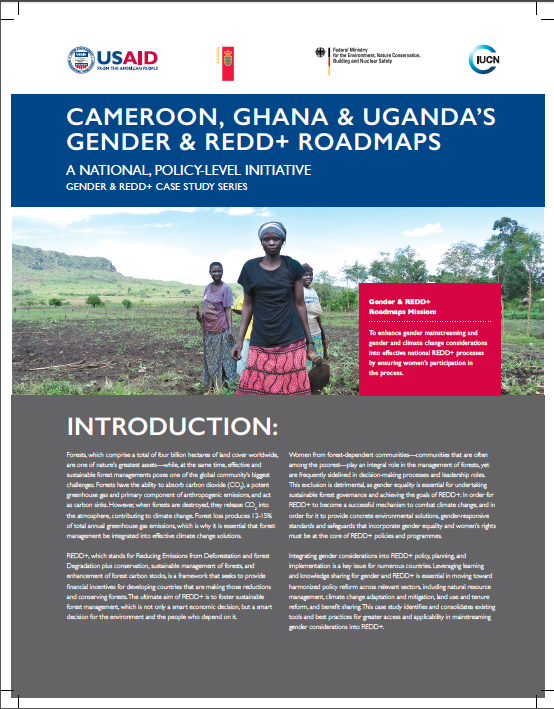 In 2011, the International Union for Conservation of Nature (IUCN), with support from the Danish International Development Agency (DANIDA), and in collaboration with the Women’s Environment and Development Organization (WEDO), facilitated participatory, multi-stakeholder workshops in Cameroon, Ghana, and Uganda to create Gender and REDD+ Roadmaps. The Roadmaps—the first of their kind—were produced during the first phase of the project for each country process and identified context-specific gender and REDD+ concerns, stakeholders, and concrete actions to integrate and enhance gender in REDD+ processes and initiatives. Currently, each Roadmap, as well as each country’s national REDD+ process, is in a different stage of implementation. Creation and facilitation of a Gender and REDD+ Task Force (GTF), or working group, is the most recent step to propel project outcomes forward and move closer to the project’s ultimate goal: to enhance gender mainstreaming and gender and climate change considerations into effective national REDD+ processes by ensuring women’s participation in the process.